The Vivo Apex 2019 with in-display speaker has an official launch date. 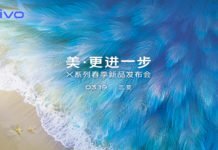 The device will be announced on January 24th, in China. It may sound unbelievable, but it is not entirely surprising. That’s because Vivo showed off the Apex concept phone, back at the MWC 2018 tech show. This featured an in-display speaker, which is made possible using vibration based screen soundcasting technology. It also showcased the Vivo Apex with the pop-up selfie camera to make a phone with a truly bezel-less screen, and then there is the Vivo Nex Dual Screen. These are examples which tell us that the company isn’t shy to up the ante, when it comes to embracing new tech ahead of other companies. And now Vivo has posted a teaser on Weibo, which shows a device with a speaker in the screen, which we think resembles the Vivo Apex 2019. The phone will supposedly be a bezel-less device thanks to the previous-gen all-screen design. We only have to wait a week until the official announcement for more information about the phone. Stay tuned to AndroidPure for further updates.